1/4″ mesh net, Extra-Tough High Density Polyethylene, UV resistant, no metal parts to rust or corrode, solvent welded frame, collapses to 8″ tall, cover is hinged with an elastic, ball ended, lanyard for quick access. Keep your live bait fish healthier and alive much longer in this durable, easy to use bait pen. The cylindrical design of this bait basket will prolong the life of any bait fish that likes to swim because there are no corners or even vertical supports for them to swim into (commonly called cornering) and hurt themselves. This includes menhaden, herring, sardines, mullet, silver jennies and many others. 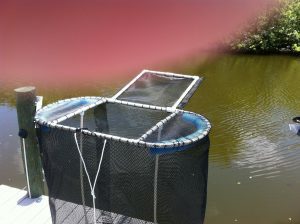 As they swim around they will contact no obstacles but the smooth 1/4 inch mesh screen. The bait pen is made completely of plastic with no metal parts to rust or corrode in the water especially salt water which is where I use mine. The basket offered here is brand new, has never been in the water. The frame is solid (not flexible conduit) PVC pipe and fixtures all solvent welded. The net is a special high density polyethylene, UV resistant, semi rigid and extremely durable 1/4 inch mesh. Sturdy enough for long years of use and fine enough to use for shrimp if that’s what you need to pen. All net and ties are of UV resistant plastic for many years of use in direct sun. Fully opened the bait pen measures 48 inches tall by 24 inches wide by 48 inches deep (about 210 gallons) but by removing the 2 center rods (store them in the collapsed bait pen) the bait pen will collapse to just 8 inches high (including handle) by 48 inches by 24 inches for storage. I wrap the dock line (10 feet included) around the collapsed bait basket to keep it secured in the collapsed state. It is quickly returned to full height by inserting the 2 center rods into the top and bottom fixtures in the center of the basket. The lid opens on a PVC frame and hinge to reveal one half of the entire top of the bait pen. An elastic lanyard is stretched over the handle to keep the lid firmly closed but is easily grabbed by the plastic ball on the lanyard for ease of releasing the cover when netting your bait fish. 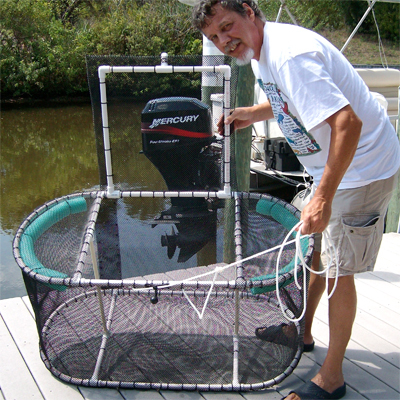 A foam column is attached on the top, to keep the basket afloat when in the water. 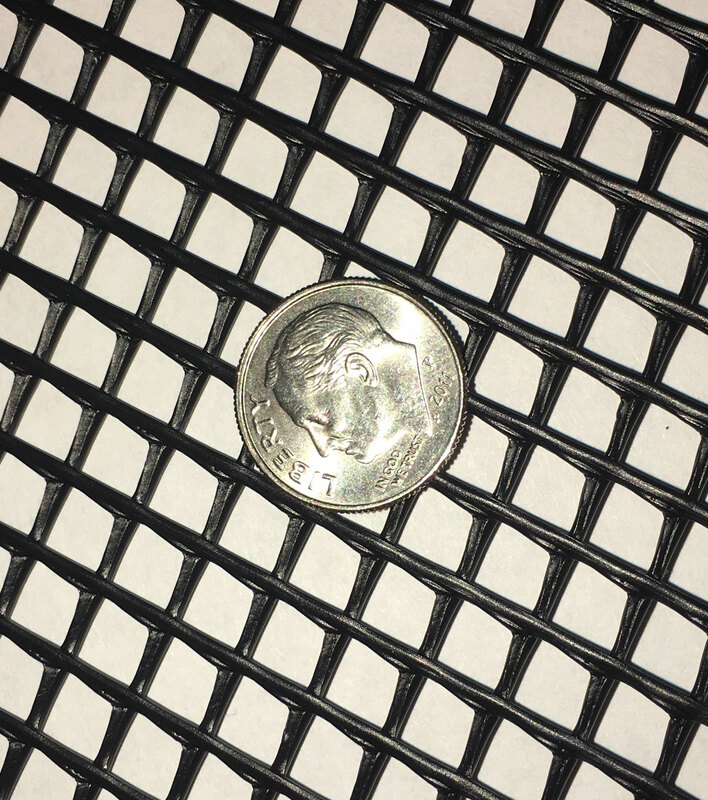 It is attached inside the basket to keep it from catching and tearing on dock pilings, boat motors, rocks or anything sharp it may come into contact with. The polyethylene mesh is more than heavy enough to keep from tearing easily on these obstructions. I’ve walked out on my dock in the early morning to see a small alligator sitting on top of my bait basket, tired and hungry but unable to bother my bait fish. I often use it to keep crabs alive until I get a chance to cook them. They try but they are unable to cut there way out, therfore your bait is save from crabs trying to get in. 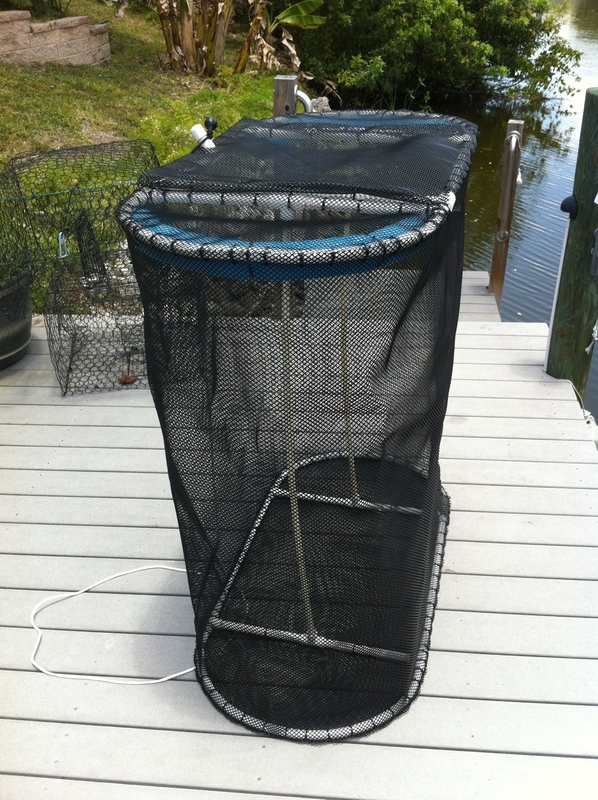 The video shows the 2′ X 2′ fishing live bait pen and how it expands for use and collapses for storage. You also get a good idea of the toughness of the netting and simplicity of it’s construction. The 4′ X 4′ X 2′ fishing live bait pen works in the same way except it has 2 uprights on either side of the door instead of the single, centrally located, upright shown in the 2′ X 2′ pen video. So far so good! Very pleased that bait seem to do well and thrive so long as the water is good but that is always an issue. Overall, bait survives better in this pen than tanks with oxygen and same water. Further more you don’t have to change water. I left bait in pen for one week and when I returned they were much better and happier than when I left them. I have added a few extra tie wraps to make sure but probably an overkill on my part. Only thing I am trying to figure out is best way to lift pen out of water and get bait when you are by yourself. When water water is down it means further to bend over. I created a long handle dip net to help but it is not a major issue. Easy to clean by washing down when you are done and want to store pen until next trip. 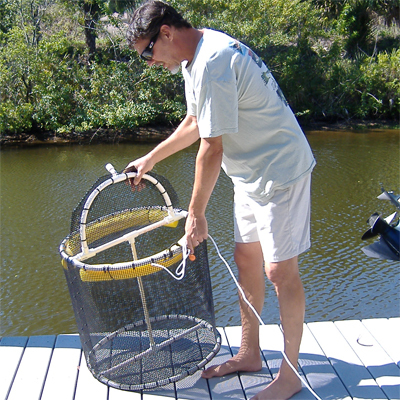 Is the float easy to remove if we want to lower basket into deeper cooler water? 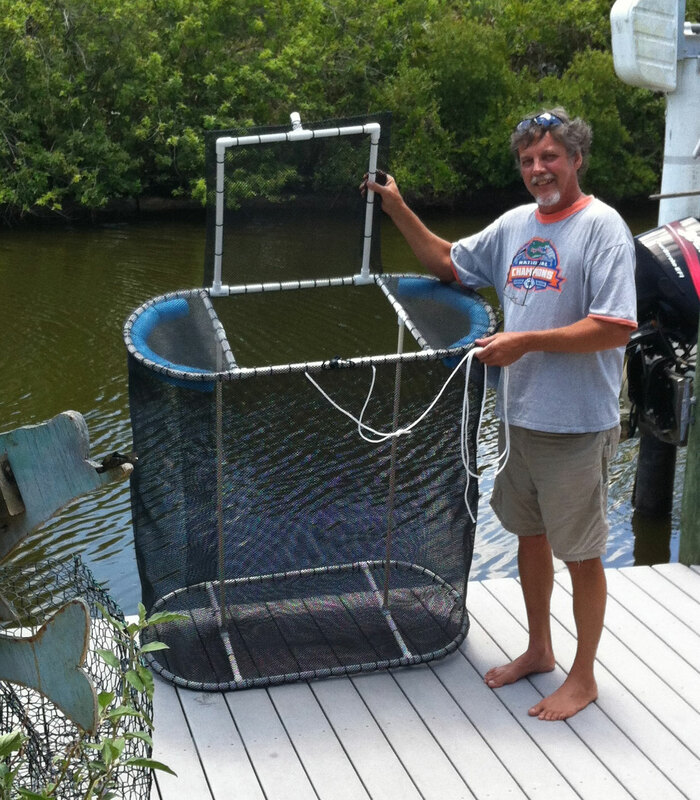 How do you think this basket will hold up over time in saltwater. Plan would be keep bait in water a few days when fishing and remove and store in closet when not fishing? It was originally designed for salt water. There are no metal parts. It will get completely covered with algae and barnacles if you leave it in the water all the time. Take it out once a month or so and leave it in the sun a few days or power wash it. My neighbor’s (2×2) is about 10 years old. I had to replace the float 3 times, the cover lanyard and most of the cable ties once. The netting and frame are still original. How long do it take to get the product after purchasing? I try to ship orders received before noon the same day. I ship via FedEx Ground or Home delivery. In FL delivery is almost always overnight but 5 days to TX is average and CA might even be a little longer.